No. 5, Medan Kurau 3, Chai Leng Park, 13700 Perai, Penang, Malaysia. 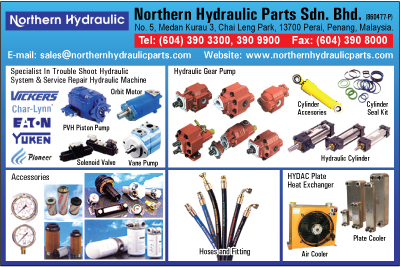 Northern Hydraulic parts Sdn. Bhd. offers products from the leading supplies in the fluid power industry. These suppliers are continually improvement and monitored based on quality of their products. This process enables Northern Hydraulic parts Sdn. Bhd. to exceed our goods to deliver the highest quality products and services in the industry. We are the specilaist in Hydraulic product and services. Our area of expertise includes hydraulic components parts for steel, paper, plastic, construction, agricultural, marine, engineering and manufacturing sectors in the country. Our technical teams are able to provide prompt efficient services to meet our customer's need such as trouble shooting, servicing, maintaining over hauling mobile and stationary hydraulic equipment. With a wide range of designs and materials we offer applications from tipping gear to cylinder seals we can provide the correct seal to ensure reliability and performance. We specialize different type of hoses for hydraulic, multi-purpose, ducting, chemical, food, steam, suction and delivery hoses. One stop solution for all types of high durable and precision material types of steel, stainless steel, brass for tube, fitting and adaptor.